Bio: Maria has been coaching at Eagles for 18 years. She is a level 2 qualified coach with a wealth of experience coaching juniors and regional senior players. Maria attends all of the Eagles training sessions and knows every single girl at the club. For many years she was the lead coach for the Berkshire Satellite Academy. Maria recently resigned the post and now works with Mavericks as assistant coach at the Henley Academy. With her excellent coaching team, Eagles have had many triumphs at National level achieving the Silver Medal in 2017 with our U16 squad. Eagles also have strong representation in the junior sections of the Franchises, Mavericks and Surrey Storm. 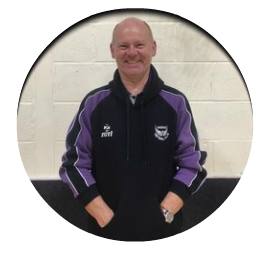 Bio: Neil became involved in netball because his wife played for a team, in the Maidenhead League, that needed someone to umpire for them. So you can blame her for everything. He went on to achieve 'c' umpire award in 1995. Neil started coaching in early 2001, after being made redundant from Barclays, with Gina McGregor at the Magnet Leisure Centre. He achieved his level 2 coaching qualification in 2004 and up dated it last year. He joined Eagles in 2007 with a group of players that reached the National Finals 3 years in a row. His personal netball achievements are nil having never played. Other sporting achievements include representing Berkshire at golf, as a junior, Essex at Football and Rugby. He even once broke 11 seconds for 100m, although it was hand timed. Interesting Fact: Neil once appeared on a TV programme called Pebble Mill at One, think the 'One Show' crossed with Phil and Holly, in a pancake race with Mary Stewart a Scottish middle distance runner from the 1970's. Bio: Carly joined Eagles 17 years ago as a junior player having attended one of their netball camps. As a junior player Carly played for Berkshire County and South Region. Carly is a qualified umpire and a level 2 coach. Injuries have cut short her senior playing days but this has given her more time to dedicate to coaching with some of the junior teams. Carly is also the Club Safeguarding Officer. Bio: Tina joined the coaching team at Eagles two years ago having signed up her daughter to the club. She is a level 2 qualified coach who has been coaching juniors and seniors for over 10 years . She captained her county as a player, and has played many seasons in the south regional league for Berkshire clubs up until just 3 years ago when knee injuries took over.